Each year, the Bavarian Academy for Nature Conservation and Landscape Management offers more than 100 events. The topics primarily are focused on the latest research results in conservation, landscape management and ecology. Since 2001, most events are held in the ANL‘s educational center: the „Kapuzinerhof“ in Laufen. Many specific environmental issues are covered and current environment policy issues are discussed. These events are held not only in Laufen, but also in the other regions in Bavaria. Unfortunately, most events are only available in German. Only a few larger events with an international character are held each year. These are mentioned on our “English home page". 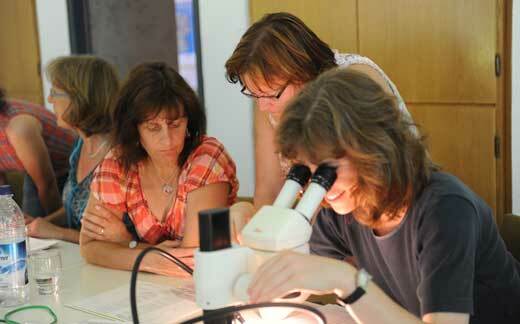 Caption: Identification course on native wasp species. Caption: Presentation of live bats during the Night of Nature.